Emotional eating, how many other descriptions do we have about our relationships with food? Our world is obsessed with fad diets & gadgets, empty promises of “6 weeks to a bikini body”, overwhelming people with minutia & confusion – but perhaps one of the most real saboteurs of our health – our relationship with food – is ignored. Yes we have a relationship with food – not just the pop cliche of emotional eating – its understanding the complexities of why, when, how & what we eat. Many of these relationships we just don’t notice – they were the “normal” of our upbringing, or it could be the way we cope with out hectic schedules & lifestyle. -Fact is, these habits can easily be problematic to our health, undermining our efforts, and yes be very frustrating to cope with! “Promiscuous eating is the wanton, reckless, unselective, casual, & indiscriminate consumption of foods without regard to the potential consequences of this “indiscretion”. It is characterized by an unhealthy relationship with food & without a long term commitment to quality foods and eating for the right reasons & in the right manner. 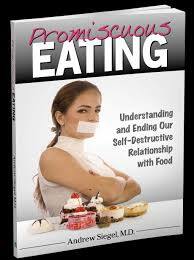 Promiscuous eating involves consistently & knowingly making poor food choices that are hazardous to our health & consuming foods for purposes other than satisfying genuine hunger.”…Can you relate? Dr. Andrew Siegel received his medical degree from the Chicago Medical School, where he was elected to the AOA Honor Medical Society. He completed a residency in general surgery at the North Shore University Hospital, an affiliate of Cornell University School of Medicine and pursued residency training in urology at the University Of Pennsylvania School Of Medicine. Thereafter, he did a fellowship in female pelvic reconstructive surgery at the UCLA School of Medicine prior to joining Bergen Urological Associates in Hackensack, New Jersey, where he has been in practice since 1988. Dr. Siegel is an avid believer in remaining young, healthy and fit through the practice of exercise, nutritional conscientiousness and intelligent lifestyle choices. He is the author of FINDING YOUR OWN FOUNTAIN OF YOUTH: The Essential Guide to Maximizing Health, Wellness, Fitness and Longevity, published in 2008. His second book, PROMISCUOUS EATING— Understanding and Ending Our Self-Destructive Relationship with Food, was published in 2011. He is passionate and enthusiastic about wellness advocacy and his goal is educating the community about healthy lifestyles and preventative measures that help ensure maximum fitness, nutrition, disease avoidance and longevity.